Yuexiu Property has ascertained development line of “attaching equal importance to Guangzhou and the rest of China”, "simultaneous development of residential and commercial properties” and “parallel running of industrial operations and capital operations”. 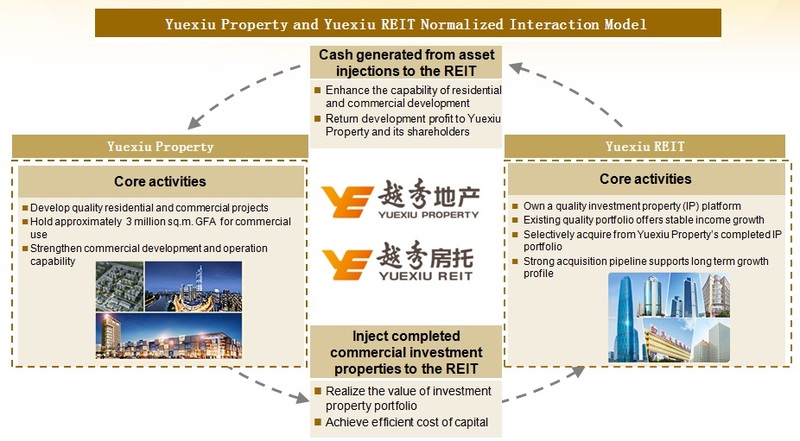 By taking full advantage of its status as the only China developer owning a REIT platform, the company seeks to promote “normalized interactions” between Yuexiu Property and Yuexiu REIT, so as to realize the transformation from the conventional real estate development model of “land acquisition + development + sales” towards a high-end business model of “development + operation + securitization” as part of its commitment to become a large and integrated real estate developer across the country with growing influence and good reputation. As a property developer operating in Guangzhoufor 30 years, Yuexiu Property has extended its business reach beyondGuangzhousince 2009. To date, the company has expanded into 12 cities across the Yangtze River Delta, Bohai Rim and central region, including Guangzhou, Foshan, Zhongshan, Jiangmen, Yantai, Shenyang, Qingdao, Hangzhou, Kunshan, Wuhan, Haikou and Hong Kong. Looking ahead, Yuexiu Property will continue to consolidate its stronghold inGuangzhouwhile accelerating its business expansion into the rest ofChina. Yuexiu Property has been upholding the strategy of driving by the double wheels of “residential properties and commercial properties”. On the basis of emphasizing on residential property development, it has also attached high importance to enhancing commercial operation capabilities. Specifically, as part of its drive to push forward the development of commercial properties, the company is ready to adopt a diverse range of innovative marketing strategies to meet the needs of different customers. On October 8, 2012, Yuexiu Property and Yuexiu REIT jointly announced the completion of a deal under which the assets of Guangzhou International Finance Center, a high-end commercial property developed by Yuexiu Property, were injected into Yuexiu REIT. This deal marks Yuexiu Property's success in establishing a high-end business model of DOS (Development, Operation and Securitization) based on the "Yuexiu Property + Yuexiu REIT" platform, bolstering Yuexiu Property's move towards a large and integrated real estate developer with core competencies. Being the only listed property developer that owns a REIT platform in the PRC, Yuexiu Property has been specializing in the development of residential and commercial properties, while Yuexiu REIT has been used as the platform to hold and enhance the prime quality commercial projects of Yuexiu Property. This advantage enables the interaction between “Yuexiu Property” and “Yuexiu REIT”, thus helping Yuexiu Property to stand out from its contenders. Yuexiu Property will continue to improve this unique model and bring better benefits to its shareholders and the society as a whole.